"Pleased to meet you! My name is Patches. Can you guess why? I'm a gorgeous medium hair tortoiseshell with amazingly soft fur and beautiful golden eyes. My previous person was unable to care for me, so I'm here at Wayside, waiting for my forever person or people to walk in and fall in love with me. So exciting! I'm a friendly girl with a great purr, and I love attention and being petted. I'll let you know how much I'm enjoying it by giving you some good head butts! I'm playful, too, especially with toys I can bat at. My previous person said I'm an affectionate lap cat who likes kids and gets along with other cats. My Felineality is Sidekick. That means I'm a people-oriented cat who is moderately brave in new situations. While I will want to spend most of my time with you, I also have an independent streak and am capable of entertaining myself. Do I sound like the girl for you? Come meet me, pretty please! Patches is very cute! She seems a lot more mellow than Binga - which is a good thing! Good luck Patches and we hope it won't be long before you get that loving forever home. Have a wonderful Wednesday. Patches is such a cute little one! We hope that your forever home finds you very soon! Patches was my childhood cat's name...I sure hope you find your forever home soon, sweetheart. 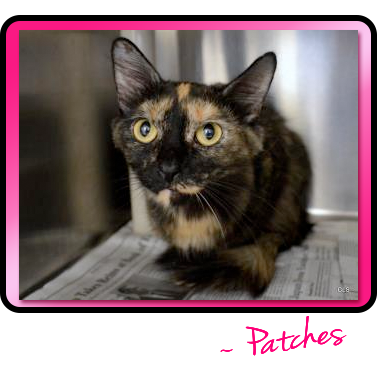 Patches is adorable and she sound like such a happy, friendly girl!!! We hope she finds a forever home very soon!!! Hello Patches, so nice to meet you. Mommy loves Torties (her always misses the Admiral) and you Patches, are gorgeous. Mom wishes she could have you but I, Katie, said no to any other kitties. I am Queen. Sigh.